Concerned Diné Citizens includes members of ENDAUM, Red Water Pond Road Community Association, Diné NO NUKES, MASE Coalition, Allies and Residents of Affected Communities. Photo Credit: Tahirah Cook. Navajo Nation Council Rescinds Mining Legislation. WINDOW ROCK, AZ—Concerned Diné Citizens, a coalition of Navajo grassroots organizations and residents opposed to uranium mining, applaud the Navajo Nation Council’s vote to close a loophole created by a previous uranium mining legislation Tuesday (7/22/14) which had authorized access over Navajo Trust Land to a uranium mining company Uranium Resources Incorporated (URI). In July 2012, URI entered into a Temporary Access Agreement with the Navajo Nation which allows URI limited access to its Churchrock property with certain stipulations, including the clean up of existing uranium contamination in the area. In December of 2013, the Navajo Resources and Development Committee acknowledged a right-of-way for URI across Navajo Trust Land to use its license to mine, effectively violating the Temporary Access Agreement, the Diné Natural Resource Protection Act and Radioactive Materials Transportation Act. The company plans to do in situ leach (ISL) uranium mining, a technique that requires pumping water with chemicals into the earth to mobilize the uranium within the aquifer in order to extract it. The Navajo Nation Environmental Protection Agency (EPA), U.S. EPA and other agencies are continuing ongoing assessment and clean up of the 521abandoned uranium mines across Navajo Nation that started with the first 5-year plan. Photos and video available upon request. For more information: http://www.endaum.com. Council debate on Legislation No. 91-14. Photo Credit: Leona Morgan. This entry was posted in Uncategorized on July 24, 2014 by endaumadmin. WINDOW ROCK, AZ—Concerned Diné Citizens and supporters will hold a press conference on Tuesday, July 22, 2014, at 11am outside the Navajo Nation Council Chambers calling for the Navajo Council to rescind the Resources and Development Committee (RDC) approval of a right-of-way that allows Uranium Resources Incorporated (URI) access to its uranium mining sites in the checkerboard area, crossing over Navajo Trust Land. The Diné groups and allies call for the Navajo Nation Council to abide by its own policy and protocol. Edmund Yazzie’s Legislation No. 0091-14, to be heard during the Council’s Summer Session, will take steps to correct a flawed process that took place on December 23, 2013 when a vote by three members of RDC passed Legislation No. 0373-13 which allows URI a right-of-way and use of its Nuclear Regulatory Commission license to potentially mine and transport newly-mined uranium on Navajo Trust Land thereby violating two Navajo Nation policies. The appropriate protocol for such a legislation that violates Navajo policy should have taken Legislation No. 0373-13 next to be considered by the Full Navajo Nation Council after RDC. The 2005 Diné Natural Resources Protection Act (DNRPA) imposes a moratorium on uranium mining and processing in Navajo Indian Country. The 2012 Radioactive Materials Transportation Act (RMTA) regulates transportation of uranium and other radioactive substances across Navajo Nation. The Diné Concerned Citizens calls on the Navajo Nation Council to make sure URI is accountable to the legally binding Temporary Access Agreement which clearly states URI agrees to cleanup up waste on Churchrock Sections 17 & 8 before new mining occurs. Concerned Diné Citizens includes Eastern Navajo Diné Against Uranium Mining (ENDAUM), Red Water Pond Road Community Association, Diné NO NUKES, Multicultural Alliance for a Safe Environment, Sierra Club Our Wild America, and many Diné individuals and local residents concerned about uranium mining. “Contamination from past uranium mining is a very serious threat and we need to come together as a People to find real solutions so that we no longer endanger our future generations. There should be no discussions on new proposed mining until we deal with existing contaminated sites on and near the Navajo Nation.” said Jonathan Perry, President of ENDAUM. For more fact information, please visit www.endaum.com. This entry was posted in Uncategorized on July 21, 2014 by endaumadmin. This week marks 35 years since the world’s largest uranium tailings spill, known as the “Churchrock Disaster”. On July 16, 1979, over 1,000 tons of solid radioactive waste and over 90 million gallons of liquid waste spilled from a uranium processing facility into a dry Puerco River east of Gallup,NM and flowed downstream into Arizona. In addition to that legacy, there are still hundreds of abandoned mines and contamination from the uranium mining boom of the 20th century left across Navajolands, all of which need to be studied and cleaned up. Indian Country. In 2012, the Council passed the Radioactive Materials Transportation Act (RMTA) which regulates transportation of uranium and other radioactive substances across the Navajo Nation. These Navajo Nation laws were adopted to protect of all of creation and future generations from the known effects of uranium mining & processing. 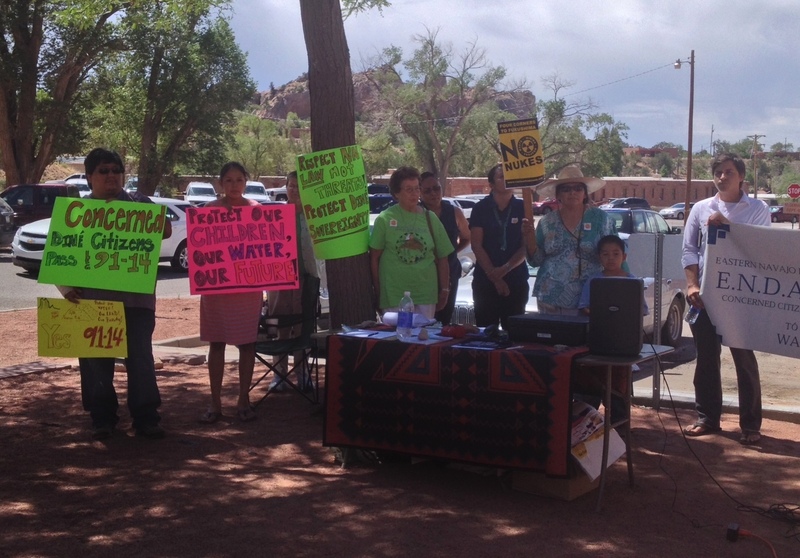 We urge the Navajo Nation Council to rescind the Resource and Development Committee’s approval of a right-of-way that allows a uranium company access to lands in the checkerboard area for new uranium mining. 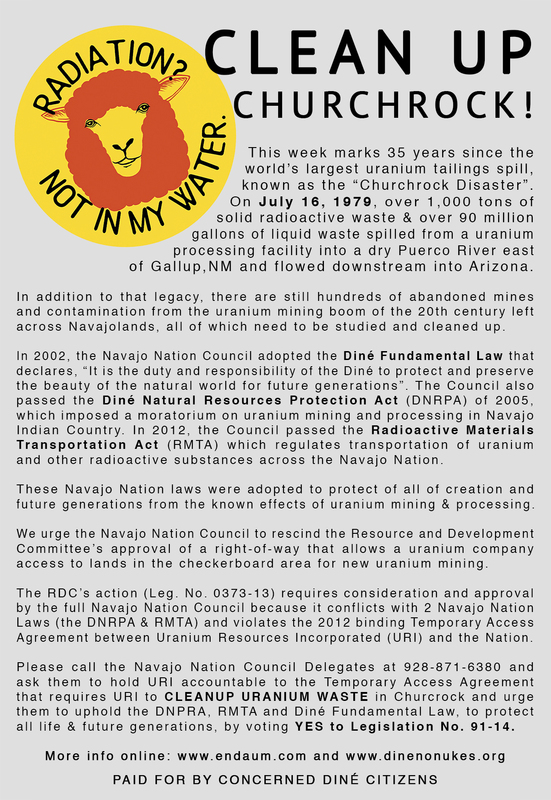 Nation Council because it conflicts with 2 Navajo Nation Laws (the DNRPA & RMTA) and violates the 2012 binding Temporary Access Agreement between Uranium Resources Incorporated (URI) and the Nation. accountable to the Temporary Access Agreement that requires URI to CLEANUP URANIUM WASTE in Churcrock and urge them to uphold the DNPRA, RMTA and Diné Fundamental Law, to protect all life & future generations, by voting YES to Legislation No. 91-14. This entry was posted in Uncategorized on July 16, 2014 by endaumadmin. by avoiding the Temporary Access Agreement it signed with Navajo Nation in July 2012. URI agreed to submit to the “full …jurisdiction” of the Navajo Nation and to CLEAN UP CONTAMINATION in Churchrock, NM (Sections 17 & 8) prior to any ISL mining. To date, URI has not started work and does not agree to Navajo clean up standards. Legislation 0373-13 (passed in December by 3 Council Delegates) has created ways for URI to avoid Navajo law and its clean up responsibility. According to the Navajo Nation Attorney General, Navajo DOJ and Navajo EPA, Leg. 0373-13 contradicts existing Navajo Policies: the 2005 Diné Natural Resources Protection Act and 2012 Radioactive Materials Transportation Act and does not cite the Temporary Access Agreement at all. The DNRPA is the uranium-mining moratorium and the RMTA sets regulations on the transport of all things radioactive. This RDC Subcommittee is doing the work of the upcoming Navajo Uranium Commission. The big difference here is that URI is at the table with Council Delegates negotiating and there’s no seat for community input. Let’s hold URI accountable to do the clean up it agreed to in the Temporary Access Agreement and get rid of Leg. 0373-13 altogether! Please SUPPORT Legislation No. 0091-14 (YAZZIE) which will rescind Leg. 0373-13 at the next Naa’bik’iyati’ meeting on Friday, June 27th. Call Navajo Nation Council Delegates at 928-871-6380 & ask to VOTE YES to 91-14 or attend the next Naabi meeting at the Council Chambers in Window Rock Friday June 27, 2014, Ahéhee’! 1) The Legislation No. 0373-13 is considered “invalid” by Navajo DOJ & Navajo EPA because it conflicts with current Navajo Nation policy. It allows URI to have a “right of way” over trust land, to use it’s NRC license and to negotiate with the Resources and Development Committee or “RDC” Subcommittee, but does not cite the Navajo Diné Natural Resources Protection Act (uranium moratorium) and Radioactive Materials Transportation Act (regulates transports) or the Temporary Access Agreement (URI agreed to Navajo Jurisdiction and to clean up first). 2) URI needs to do clean up in Churchrock before any ISL mining according to Temporary Access Agreement, and they need to Clean Up according to Navajo EPA’s standards. 3) The land referred to in this legislation does not involve Navajo Indian Allotments, but the impact of Leg. 0373-13 challenges our Navajo DNRPA and RMTA, especially in the checkerboard area, and protects the interest of the mining companies over the People. 4) Community Opposition to NEW Uranium Mining is STRONG!! Several Chapter Resolutions (and 2 Agencies) have been passed opposing Leg. 0373-13. There are many reasons to keep new mining from happening, from our health and economy to the realities that we have no adequate EMERGENCY RESPONSE and NO NAVAJO PREFERENCE for hiring. The most important reasons are for the protection of Dinétah our WATER for the FUTURE GENERATIONS. This entry was posted in Uncategorized and tagged 0373-13, ENDAUM, ISL, Navajo Nation, uranium, uranium mining, URI on June 26, 2014 by endaumadmin.